Funded by President Marc Tessier-Lavigne and School of Medicine Dean Lloyd Minor, and lead by Senior Associate Dean for Global Health and SRRP principal investigator Michele Barry, the project aims to accomplish its three phases – identifying potential contributors, conducting research and implementing a pilot program – over an 18-month period. SRRP is now in the research phase. In May, the SSRP plans to conduct a campus-wide learning day to engage the community. The project came to fruition through the endeavors of Stanford global mental health researcher Laila Soudi, who was born and raised in Jordan. Soudi reached out to Tessier-Lavigne expressing her frustration with the University’s inaction regarding the Syrian refugee crisis. After Soudi submitted a thorough proposal and budget, Tessier-Lavigne approved funding for the SRRP. When Soudi first came to Stanford in Nov. 2015, she noticed a lack of opportunities in the field of global mental health. After conducting research on adolescent mood disorders in Stanford’s Pediatric Emotion and Resilience (PEARL) Lab for over a year, Soudi met Dr. Victor Carrión, the director of the Early Life Stress and Pediatric Anxiety Program (ELSPAP) and Carrión expressed interest in developing a global mental health branch of the Program. 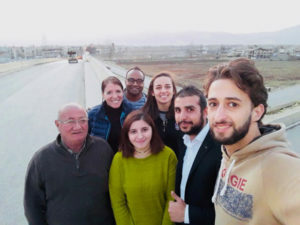 Using her experience working with refugees in the Middle East, Soudi helped implement a global health initiative that allowed her to travel between Jordan and Lebanon to interact with Syrian refugees. Through her visits to refugee camps, Soudi became clear in her conviction that mental health is the most neglected issue in this humanitarian crisis. “The more that I talked to people, whether they were refugees or internally displaced people within Syria, the more I reached an understanding that the mental health symptoms — primarily the depression and anxiety — were really because of structural violence,” Soudi said. Barry accompanied Soudi on one of her trips to Jordan. “I was frankly shocked to see a patient chained to the wall because [humanitarian aid workers] had no way to sedate him or treat him with the antipsychotic medications he needed,” Barry said. She also cited the prevalence of post-traumatic stress disorder (PTSD) among displaced people as an urgent concern. In addition to the insufficient mental health services in refugee camps, Syrian refugees also lack adequate access to water, food, sanitation, education and employment. The current research team comprises a six-member core leadership team and a group of ten student research ambassadors from across Stanford’s seven schools. “The idea of bringing people together from across the university is to really look at the refugee crisis holistically and in a multi-disciplinary perspective,” Soudi said. Many members of the SRRP research unit have personal connections to the region. Nadia Roumani, senior advisor of the SRRP and director of the Effective Philanthropy Lab in The Stanford Center on Philanthropy and Civil Society (PACS), was raised by Syrian parents and frequently visited the Middle East during her childhood. “Ever since the [Syrian] war started, it has been really frustrating to know what’s happening and to feel like there’s so little I can do,” Roumani said. Through the SRRP, the team aims to address this sentiment of helplessness shared by members of the research team. The group took its first official trip to Lebanon and Jordan in late December of 2017. Over the course of a week, the team apprehended the needs of over 4,000 Syrian refugees through conversations with appointed representatives from refugee communities. They also met with various non-governmental organizations (NGOs) to understand how an academic institution could supplement the efforts of those NGOs involved in the crisis. According to Soudi, NGOs are often so involved in meeting the short-term daily needs of refugees that they are unable to monitor and evaluate the long-term effectiveness of their work. “It would require an academic institution to really leverage those technical skills and research capacities,” Soudi said. Both Soudi and Roumani noted the abundance of privilege, resources and skills within the Stanford community. “You see all this wealth and you see all this opportunity and technology, and yet it feels so far away from the situation that’s happening,” Roumani said. Ultimately, the SRRP aims to identify the ways in which Stanford and other academic institutions can contribute their expertise to help improve refugee conditions in Lebanon and Jordan. In doing so, the team strives to educate the Stanford community about the nature of this complicated crisis and provide opportunities for students to work directly with refugees. Notable events planned for the May symposium include NGO representatives describing the needs of Syrian refugees in Jordan and Lebanon, panels discussing engagement models and solutions to refugee crises and Syrian refugees from the Stanford community sharing their stories.